It’s time for another list. This time I’m going to tell you about my top five favourite games for the awesome Playstation 2 console. Before I share my list with you, I’ve got something that I must admit. It so happens that I traded in my Playstation 2 (plus some cash to make up for the price difference..) for a Nintendo Wii some months ago. I truly regret making that decision, but I thought the Nintendo Wii would offer hours and hours of fun at the time. I’m sure some people enjoy the Wii, but it just doesn’t do it for me. I used to play games on my Playstation 2 every week, but the Nintendo Wii is hardly ever used. It just sits quietly beneath the TV in the living room and gathers dust. The only game I play on it is Mario Kart, which is fun in multiplayer. To make it worse, I’ve moved my Amiga CD32 into the living room, so now I’m even less interested in the Nintendo. Anyway, not much I can do about this now. As the Undead Crypt Fiends in Warcraft 3 says: “What’s done is done”. You can find more information about the game on the LOTR: The Third Age wiki. One of my favourite genres is shoot’em up’s. Especially side-scrolling ones like Gradius V. This shoot’em up is definitely one of the best I’ve ever played, even though it is very difficult. 😉 Everything from graphics to audio is excellent in this game, and the gameplay itself is top-notch. God of War II is an awesome action-adventure game for the Playstation 2. The graphics are simply stunning and my jaw dropped to the floor the first time I saw the game live. Please have a look at the video above and you’ll see what I mean. This might come as a surprise to some of you, but my fourth favourite game for the PS2 is actually Super Bust-A-Move from Taito. The reason is that it is incredibly fun in multiplayer. 🙂 I love the variety of characters with unique strengths and weaknesses, the vast number of different levels, the bonuses and the overall atmosphere of the game. Baldur’s Gate is a fine RPG with a decent storyline. Hack’n’slash your way through hordes of enemies, earn XP’s, solve problems, trade stuff and explore – all ingredients in this cool game. There it is, the list of the games I enjoy the most on the PS2. It was not easy to make such a short list, but I think it came out correct in the end. 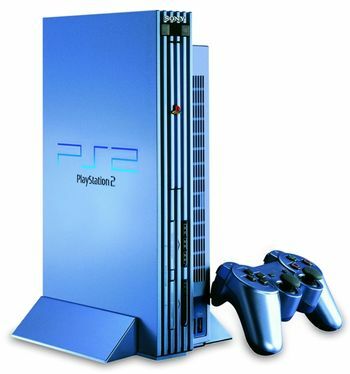 What are your favourite games for the PS2? Please leave a comment below. It will be interesting to see what kind of games you enjoy playing on this console. So, why dust it when u have these great games? I have purchased Forbidden Siren, Yakuza and Yakuza 2 with the intention to play them, but I actually didn’t unwrap them yet. Too many games! I agree.. there are so many games to play.. it’s hard to find the time to try them all. Great list! I spent A LOT of time playing Gran Turismo 3 on Ps2. Its easily one of the greatest racing games ever. It made my top 20 that I did last year. Thanks for the comment, Pat B. 🙂 I’d love to try Gran Turismo 3 some time. It looks very good graphically and I’ve heard that the gameplay is fun as well. What do you think of the Need for Speed games on the PS2? I love the Bust-A-Move games. Baldur’s Gate: Dark Alliance was pretty cool too. Cool that you too enjoy playing Bust-A-Move. 🙂 Such kind of games never goes out of style. If you are into RPG then the best on the Playstation2 was Dragon Quest 8 -Journey of The Cursed King. Really detailed graphics and storyline, plus some great voice acting, a really great addition to the series. Did u see the new games they showed at E3? I’m so excited! I can’t wait until the new Assassin’s Creed comes out!